يوراگوائي:( i/ˈjʊərəɡwaɪ/; Spanish pronunciation: [uɾuˈɣwai̯])جنھن جو سرڪاري نالو اورينٽل ريپبلڪ آف يوراگوائي آھي (Spanish: República Oriental del Uruguay) ھڪ خودمختيار ملڪ آهي جيڪو ڏکڻ آمريڪا کنڊ ۾ واقع آهي. ان جون سرحدون اولھ ۾ ارجنٽينا، اتر اوڀر ۾ برازيل،ڏکڻ ۾ ري او ڊي لا پلاٽا نديءَ (چانديءَ جي نديءَ)سان ۽ اوڀر ڏکڻ ۾ ايٽلانٽڪ سمنڊ سان لڳن ٿيون. ↑ Central Intelligence Agency. "Uruguay". The World Factbook. Langley, Virginia: Central Intelligence Agency. حاصل ڪيل January 1, 2017. 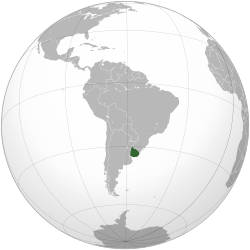 ↑ 4.0 4.1 4.2 4.3 "Report for Selected Countries and Subjects – Uruguay". World Economic Outlook. International Monetary Fund. ↑ "GINI index (Cepal)" (PDF). Cepal. حاصل ڪيل 3 January 2018. ↑ "2016 Human Development Report" (PDF). United Nations Development Programme. حاصل ڪيل 25 March 2017. هيءُ صفحو آخري ڀيرو 07:04، 22 نومبر 2018ع تي ترميميو ويو هو.